Licensed Photograph of Heavyweight Champ Muhammad Ali. 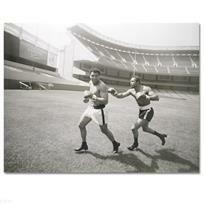 Own a piece of sports history with this Muhammad Ali photo. Taken at the peak of his success as one of the greatest heavyweight championship boxers of all time, this photo is sure to complement any sports memorabilia collection. 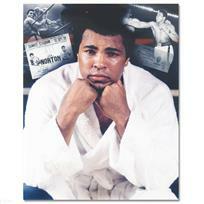 This is a licensed photograph of Muhammad Ali on paper. Measures approx. 12" x 15" (no border). Born Cassius Marcellus Clay, Jr. on 17 January 1942 in Louisville, Kentucky, Muhammad Ali carries the legacy of one of the world’s greatest heavyweight boxers. His interest in boxing began when, at twelve years old, his bike was stolen; he wanted to beat up the thief, so he began training. A natural talent, he soon won the 1956 Golden Gloves Championship as a novice in the light heavyweight and it wasn’t long before he qualified for the U.S. Olympic Boxing Team. 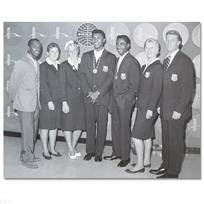 Ali brought home the light heavyweight gold medal from the 1960 Olympic Games in Rome. For the next decade he was an unstoppable force in the ring and in 1964 he won the World Heavyweight Championship. 1964 was also the year that Ali found inspiration in the Nation of Islam and changed his name from Clay to Ali. His spiritual and political views eventually got himself in trouble in the ring; when he refused to fight in the Vietnam War in 1967, citing his status as a conscientious objector, the boxing association revoked his championship title and suspended him from professional boxing for three years. Upon his return to the sport in 1970, Ali reestablished his place in the boxing hierarchy during the next decade. In 1971 he battled Joe Frazier in “The Fight of the Century” and although he was knocked out after 15 rounds, Ali bested Frazier in a rematch in 1974. That same year he reclaimed his championship title in the “Rumble in the Jungle” in Zaire against the reigning World Heavyweight champion, George Foreman. After countless excellent battles in the boxing ring over the next few years, Leon Spinks defeated Ali in 1978, marking the beginning of the decline of Ali’s career. 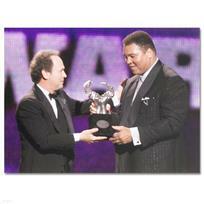 After losing his heavyweight title to Trevor Berbick in 1981, Ali retired from the sport. Muhammad Ali passed away on June, 3rd 2016 at the age of 74. 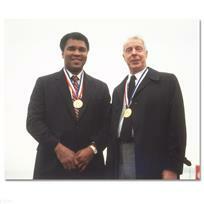 Licensed Photograph of Heavyweight Champ Muhammad Ali and Joe Dimaggio. 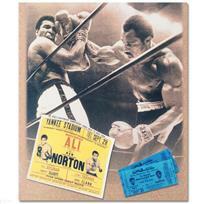 Licensed Photograph (40" x 30") of the Heavyweight Champs Muhammad Ali and Ken Norton. 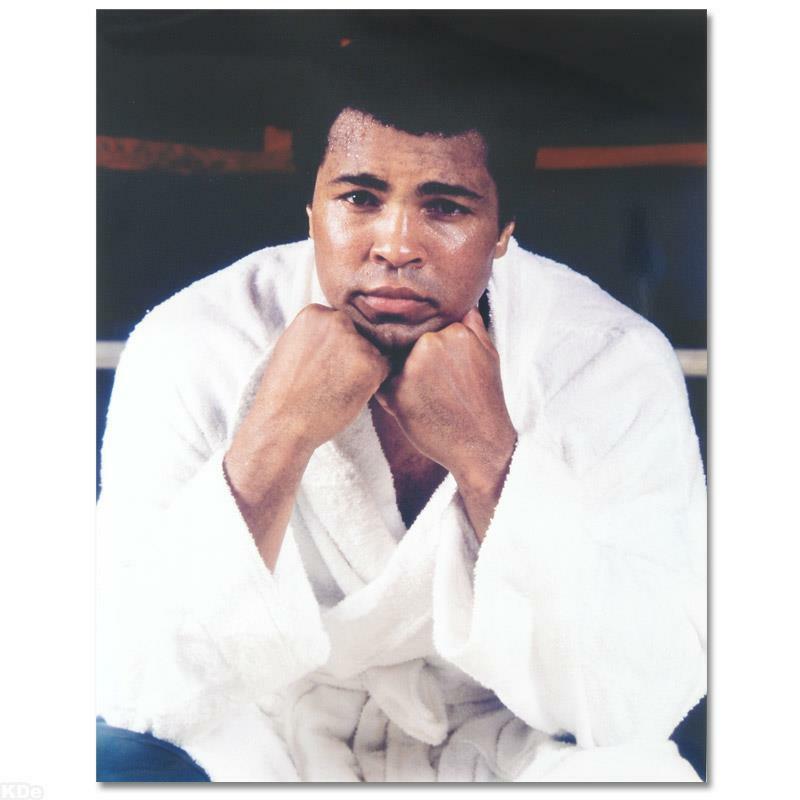 Licensed Photograph of Heavyweight Champ Muhammad Ali(40" x 30"). 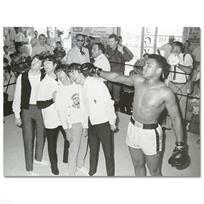 "Muhammad Ali Punching The Beatles" Licensed Photograph of Heavyweight Champ Muhammad Ali and the Beatles (40" x 30"). 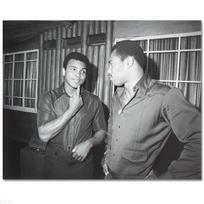 Licensed Photograph of the Heavyweight Champs Muhammad Ali and Ken Norton.